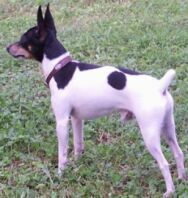 The Toy Fox Terrier is small and range from 3 1/2 to 7 pounds or 8 1/2 to 11 1/2 inches at the shoulder. The body is square when viewed from the side. The length of the body from shoulder to rump is equal to the height from shoulder to foot. The body is compact and muscular with the short tail set high and erect. The coat is predominantly white, short, shiny and smooth. Toy Fox Terriers are quite intelligent, alert, loyal, fearless with plenty of endurance. The Toy Fox Terrier can best be described as tiny, tough and tenacious. They are energetic, lively and strong for their size. Toy Fox Terriers are comical, entertaining and remain playful throughout their lives. They are friendly and loyal, yet protective of thier loved ones. Toy Fox Terriers don't know they are small. They think they are as big or bigger than any dog they encounter. Due to their fearlessness, I strongly encourage obedience training. This, along with leashing your Toy Fox Terrier, may some day save his life. The Toy Fox Terrier is versatile. Whether you live in a small apartment or a large pastoral setting, the Toy Fox Terrier readily adapts. Normal “run of the house” gives them all the exercise they need. Toy Fox Terriers should NOT be kept outside continually. In cold weather a sweater or coat is necessary. In extreme heat, air conditioning is best. Toy Fox Terriers eat very little and therefore are economical. No special grooming is required, just an occasional bath and brushing. Toenails should be trimmed short enough that if the dog is standing the nails do not touch the floor. If you feel uncomfortable doing this, your Vet or local grooming establishment will do this for you at a nominal fee. I suggest that they be cut about every 8-10 weeks. Because of their superior intelligence, they are easily house trained or paper trained. If you’re not sure how to go about this or not sure of what method to use, consult your local bookstore, library or the web. There is a wealth of information out there. Research and pick the best method for your lifestyle. As with any breed, socialization is important. Obedience training will help in this area. Taking your Toy Fox Terrier out to public places helps a lot too. Expose them to a lot of different situations and sounds. I do not recommend this breed for small children. That goes for any toy breed. The toy fox terrier remains a true terrier. Their instincts for hunting are strong. This can be confirmed by any toy fox terrier owner. It’s not uncommon for the little guy to proudly present you with his prized catch of a squirrel, possum, mouse, rabbit or snake just to name a few. Toy Fox Terriers make great companions. One minute a lap dog, the next minute fiercely guarding the home from intruders. They love to go on car rides. Just try to leave without them! I haven’t decided if their hearing is that acute or if they posses ESP. I’m leaning toward the latter. The Toy Fox terrier may come in a small package but they are little dynamos. Therefore, if you’re considering one, you won’t regret saying YES.